Pilots aren’t necessarily going to follow through with the threat, but it speaks to the deteriorating talks and the ongoing frustration with the different contracts under which pilots from the old United and Continental still operate. United Airlines plane taking off. Photo by InSapphoWeTrust. Pilots from United and Continental airlines — still represented under separate labor contracts nearly two years after the airlines merged — have voted overwhelmingly to allow a strike against their parent company, union leaders said Tuesday. 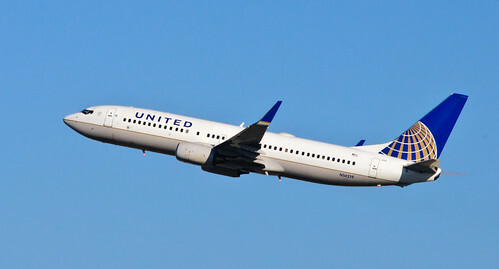 The pilots’ groups, represented by the Air Line Pilots Association, have been negotiating on a joint contract with United Continental Holdings for more than two years and are frustrated over not yet having reached a deal. According to a statement sent out by ALPA Tuesday, 99 percent of pilots voted “in support of a withdrawal of services, if required,” with 94 percent participating in the vote. “The strength of this vote clearly indicates the level of frustration our pilots have with management’s disinterest in reaching a conclusion to negotiations,” Capt. Jay Pierce, chairman of the ALPA unit representing the Continental pilots, said in the statement. The pilots have twice asked the National Mediation Board to declare negotiations at an impasse, one in a series of steps they would have to take under federal law before a strike could occur. The board has been involved in the negotiations since February 2011. United spokeswoman Megan McCarthy said in an email the company expected the strike vote. “The vote results alone do not permit the union to take any action,” she wrote, “as there are several other procedural steps required under the Railway Labor Act” — the federal law governing the negotiation process.